It is always relaxing to lounge in a swimming pool. During day-time, you get to bask in the heat of the sun while enjoying the water. At night, you can unwind and watch the stars. However, during night-time, a swimming pool is basically useless if not outright dangerous if it does not have lighting of any sort. Lighting will not only help you ensure safety – it could also add to the ambience. If you want a soothing atmosphere, you could go for calming wall lights with blue overtones. 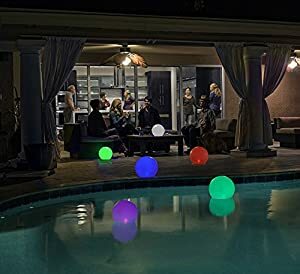 If you’re looking to have some company, you can go for globe lights with changing colors and set the mood for a fun party. With the right lighting, you can convert your backyard pool into something reminiscent of a luxury resort. There are many different kinds of swimming pool lights and those who are not too deep into pool technology might not be aware of what pool light would suit his or her needs. That’s why we did the legwork and came up with our list of the best pool lights based on research and pool light reviews. 3 Why Are LED Lights so Popular? Intellibrite spa light that has 5G colors is the most energy-saving and brightest underwater light on the market. Its spa lights have a perfect blend of different color spectrums. This item can be easily rotated by using the Intellibrite Automated Controller. It has a design that distributes the light evenly. The bright and intense colors are not blinding. Its control systems and features give added convenience. It is difficult to install. The warranty is too short. It only lasts for 30 days. This LED pool light uses a patented technology called Chromacore together with an advanced LED system and a microprocessor. Therefore, you can expect vivid and numerous colors. It is energy-saving. It uses 86% less energy and can last 10x longer than incandescent lights. It can be easily installed. There are 10 fixed colors and 7 color-changing modes. You might need to hire a professional to install it. The warranty is difficult to avail. 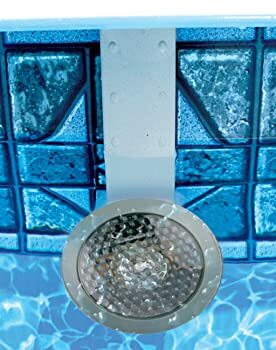 What makes this product possibly the best led pool light is it provides great illuminating features. It has 50,000 hours of lamp life, and 6 colors with 2 color changing modes. The 6 colors include blue, red, magenta, green, amber, and white. Moreover, it can be controlled wirelessly through the power centers of S.R. Smith. It has 4 trim rings that can fit any pool or spa surface. 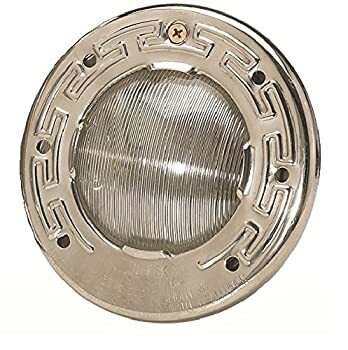 It works with a wall fitting, which has a standard thread of 1.5 inches for the diameter. Having many uses is one of its advantages. It comes with a 3-year warranty. It will be best to test it first before adding water. This bulb for swimming pools has 12 volts, 7 colors, and 4 speeds of color changing. For the speeds, there are rapid which lasts for a minute, slower which lasts for 5 minutes, and the slowest which lasts for 20 minutes. There is no need for a remote control. The lights with the same electrical circuit can be easily synchronized. It has a 5-year warranty. It comes with an instructional manual. The active cooling system makes it long lasting. The red light is not very bright. This product might be the best underwater pool light available on the market. You can use when you have night swimming and pool parties. The NiteLighter series have been lighting pools for 15 years, so it can be considered as a reputable brand in this industry. It can be installed without any difficulties. It comes with an extra long cord that has passed quality testing. It has a 6-month warranty. Breaking down easily is one of the common complaints of customers. Its bulb does not tightly fit. This pool light from Intex is one of the best above ground pool lights. It utilizes magnetic technology, so it can produce a current, which has low voltage through the sidewalls of your pool. In addition, it can give brightness that is more than what a 50-watt halogen pool light can give. You can put this anywhere on the sidewall, and you can let it float if you separate it from its power source. It provides convenience because the LED lights are extra bright and easy to affix with magnets. It is not a problem if it dislodges since it is designed to float. No batteries are needed due to the exterior power cord. It does not consume much energy. Its illumination can last for a long time. The lights are not very bright. The brightness is similar to a 10-watt light bulb. 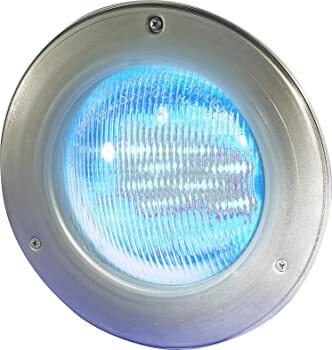 This pool light can be used in any special event such as a wedding, a formal event, or a party. 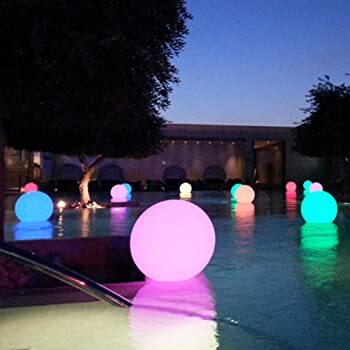 Therefore, it can be considered as one of the best floating pool lights. It can provide the perfect atmosphere for your event because of its vivid colors. You can place it on any flat surface safely. Many items for its maintenance are included. It is water resistant, and it can float in water. It can work for 8 hours if fully charged. There is an induction charging plate. It is a perfect conversation starter because of the color light show. It cannot be submerged in water. The charging time is 8 hours, which is quite long. LOFTEK is a pool light that is multi-functional. Because it looks stylish, it can be used as a decorative piece in any event. There are many shapes to choose from such as pyramid, cube, and sphere. You can choose sizes that range from 8 to 16 inches. For the lighting, it has RGB lighting system with 16 colors and 4 different modes for your color-changing preferences. 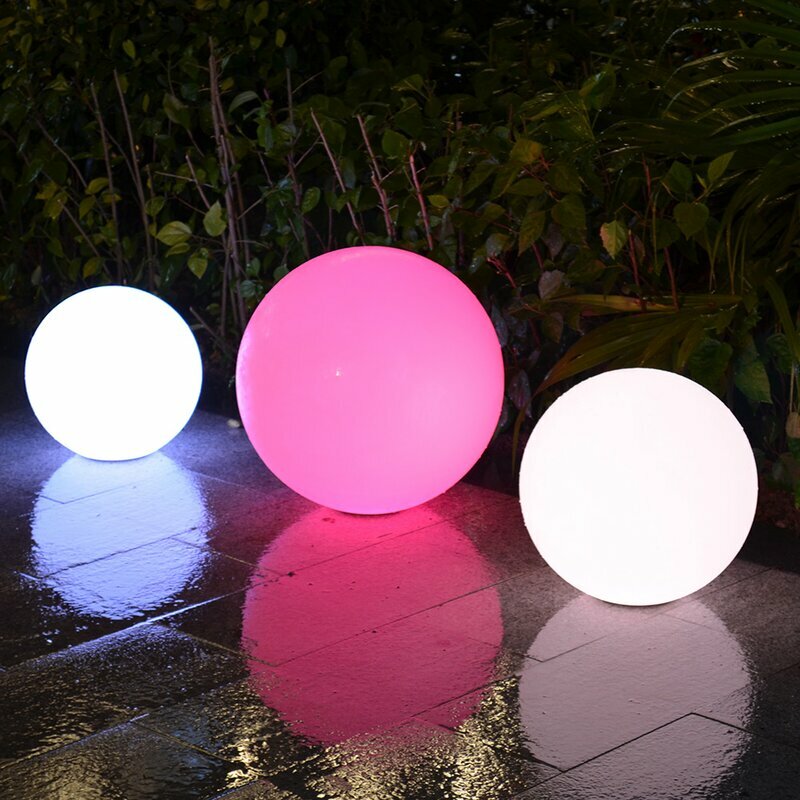 It has a vibrant LED light with various colors with a 16-inch acrylic sphere housing. Its lithium battery has high capacity. It only needs to be charged for 4 hours to work for 12 hours. You can have an entertaining light show because of the colors and modes. It is waterproof and environment-friendly. It can be easily damaged. The battery tends to deteriorate. Every ball in this product comes in 13 various colors and 3 modes. The balls are waterproof, so they can last for a long time. These are also perfect whether you use them indoors or outdoors. The manufacturer offers extra items in the package. There are extra batteries included. The colors of the balls glow well. It is also versatile and stylish. A remote control is available, and it can be hung. The light of the balls only lasted for around 3 hours. It is quite costly to change the batteries. This item is one of the best in-ground pool lights since it is resistant, easy, and beautiful. Its colors have more than 50 changing effects. Its added bonus is an electric connector that makes installation better. You can save more energy and money using this item for your pool. It can fit most Pentair Hayward Fixtures. It boasts high-quality color-changing light. Pools with different shapes can be matched with this product. You save more money because of its LED technology. The cooling system feature makes the product last longer. It may not last for a long time. The colors change and then stop. The remote that comes with it intermittently functions well. 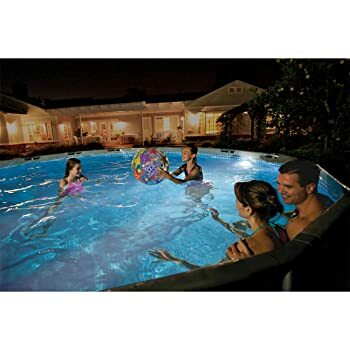 This kind of pool lighting features rechargeable batteries that charge regardless of weather. It can run for 6-8 hours on one full charge. The space is completely sealed and gives no room for leaks at all. An outstanding feature of this variety is that it can be suspended from an elevated spot for a disco ball effect with an integrated hanger. 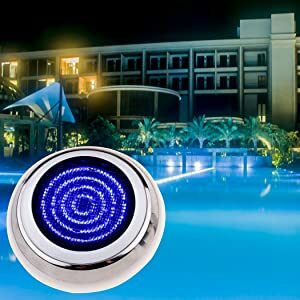 It is more than just a pool light. You can use it for your house parties as well. This pool light variant is 100% solar powered, 100% waterproof and can run on 6 hours on a single charge. Assuming it will automatically light up at sunset, it can stay lighted up until midnight for zero electricity cost to the owner. This is a viable option for eco conscious pool owners. It has five color changing modes. Everyone might have thought that eco-friendly lighting, although efficient, could be boring. But for this type, it looks like it can provide the same amount of excitement and entertainment which typical pool light types can provide. There are two main types of light sources for swimming pools; LED pool lights and Fiber optic pool lights. Both types have differences in terms of brightness, level of maintenance, ease of changing bulbs, and costs involved. These can be installed in different manners and they can be powered by different sources as well. 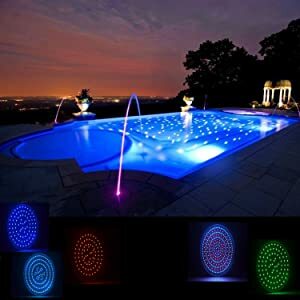 There are underwater pool lights which make the whole pool light up and there are floating pool lights which are mainly for aesthetic purposes. Nowadays, there are also pool lights that rely on renewable energy and that are solar powered pool lights. LED has been the leading lighting technology for various applications for many years already. This technology is utilized in almost every area of the average person’s everyday life. You’ll see it in television sets, smartphones, and even billboards. LED pool lights are meant to be encased in housing to keep water out. After all, these lights will be fully submerged in water. However, contrary to popular belief, it is surprisingly easy to replace LED light bulbs – even those in inground pools. There is no need to reduce the water level. You can just bring the housing out of the water and then replace the bulb. It should take around 15 to 30 minutes. You generally have to replace the bulb after 7 to 15 years. 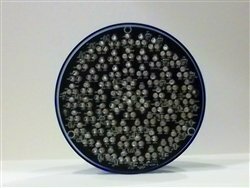 For those pool owners looking for a more dynamic option, there’s the Fiber Optic Pool Light. With this, you’ll have plenty of versatility in creating amazing light displays. You can program some changes with the push of a button. 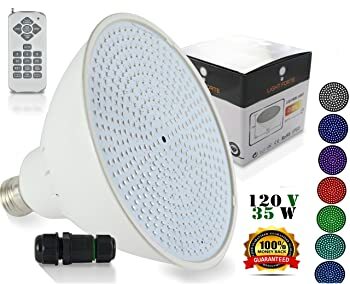 However, this technologically advanced pool lighting comes with some disadvantages as well, which is why some pool light reviews would say that the better option would be to go with LED lights. While changing bulbs would only take less than five minutes for this type, it costs significantly more than its LED counterpart. The initial cost would be somewhere at $900-$1500 on a new construction and a level fan is needed to cool the bulb. An electric motor is also necessary to that the color wheel could be rotated which would in turn cause the light to change colors. These bulbs last three to seven years and can be replaced for $200-$300. They aren’t as bright as LED lights but they’d do great if you’re only looking for mood lighting. 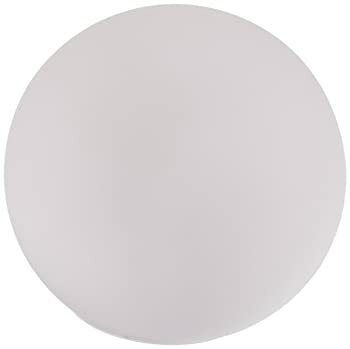 Pool light bulbs come in a range of types, sizes, and colors. You can choose from incandescent or CFL bulbs or LED pool lights. 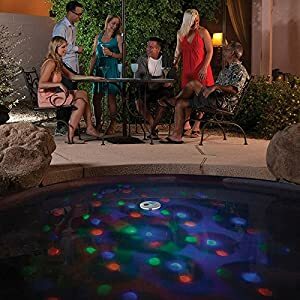 You can even opt for color changing pool lights that would allow you to cycle through colors over time, or to change it as desired using a remote control. Incandescent or CFL bulbs are great if your goal is utility lighting because compared to color lighting white light illuminates a large area. There are also white led lights though, and as mentioned, led lights are more energy efficient and longer-lasting. Pool light bulbs come in either 120 volt or 12 volt. While the numbers might intimidate some pool owners, there is hardly any difference in brightness between both types of bulbs however; the 12 volts variant operates at a lower and safer level of electricity. In some localities, ordinances require all pools to operate only on 12 volts for precautionary purposes. Eco-friendly technology has been a major consideration for the past few decades and it looks like pool lighting technology has followed suit with the development of solar pool lighting. This kind of light give pool owners the freedom of a portable light but is more cost efficient since it is powered by the sun. This option is low-maintenance and can bring bright hues to a pool at night with energy gathered from the sun with absolutely no added cost for charging or batteries. This would also do wonders for the environment and for the electricity bill with the use of efficient renewable energy. Another appealing option for those looking for some lighting on pools would be floating pool lights. However, these are mainly used for aesthetic and not for lighting purposes. Some items take the form of shapes such as candles or hearts while there are also other that emit light in a manner that manner that makes the pool look like a fountain. 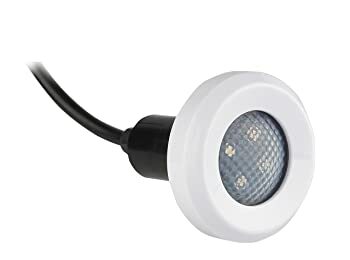 These are basically lights that would easily adhere to the wall of an above ground pool and often use LED light to make sure that they last for a very long time. Batteries are also not an issue for these types since they are typically powered by a transformer and run on 12 volts of power. They are very safe and will not interfere at all with the pool’s filtration system. LED, or Light Emitting Diodes, is still the gold standard for pool lighting technology despite there being more advanced technologies getting introduced to the market. The popularity of the LED lights could be attributed mainly to the trend of going green. LED lights are energy efficient so while they require higher upfront costs, they will allow you to save money over time while reducing your carbon footprint. They will last for a long time. They can last for as long as 15 years. They also offer excellent illumination. In fact, a single LED lighting fixture can illuminate an entire 16 x 38 (feet) pool. It’s also safe to use because pool lights are generally low-voltage. Even incandescent bulbs seem to have been replaced by CFL and LEDs. This created a boom in the development of LED for lighting purposes and these have evolved to be more cost-efficient, durable, and stronger than they ever were. There are many ways to beautify and illuminate a swimming pool at the same time. In doing so, a pool owner or designer has to consider, among others, the cost involved, the brightness capacity of many different types, and the different customization options available for each type.